Buying your prom dress is a fun adventure. As you spend the day with friends and family members, you can try on fun dresses and those that have a touch of elegance until you find something that sparkles for your amazing night. It’s best to go shopping as early as possible as there are some issues that you might run across if you wait until the last minute to buy the dress that you want. 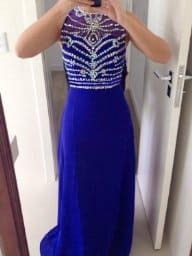 When you go to a store that has several formal dresses or to a store that you’ve been to that has just what you want, you might find that there isn’t much left over or that your top pick is no longer available. This is perhaps the worst feeling in the world as you’ve had your heart set on a specific color or design and find that it’s not an option. If you find a dress that you like, go ahead and buy it because there’s no guarantee that it will be there later. If you wait to buy your dress, you might discover that there are alterations that are needed that you don’t have time to get done. Some companies that offer alterations are booked weeks in advance of prom nights because people want their dresses to look a certain way or need to be taken in or let out to fit just right. Buying your dress early can ensure that you get the best fit for your body while wearing the dress. You’ll want to wear accessories with your dress. However, waiting to buy your dress could mean that there isn’t much left to choose from in the way of necklaces, earrings and bracelets. There will probably be basic pieces that you find, but if you wait to buy your dress, there might be a specific color or design of jewelry that you won’t be able to find to wear. Expect to spend more money if you buy your dress after everyone else. Stores operate on supply and demand. They know that people will pay more for a dress if there aren’t many left, and if you wait to get a dress, then you’ll likely miss out on the initial savings that stores offer. Buying your prom dress is a fun task that you need to get out of the way as soon as you can. Save yourself some money by shopping early and getting the desired accessories to pair with the dress a few months before the event. You also stand a better chance of not wearing something that someone else has on at the prom if you buy early.